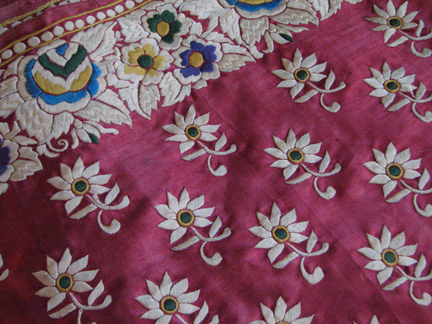 Because these saris took so long to embroider, they were extremely expensive and craftsmen in Surat began to copy them. 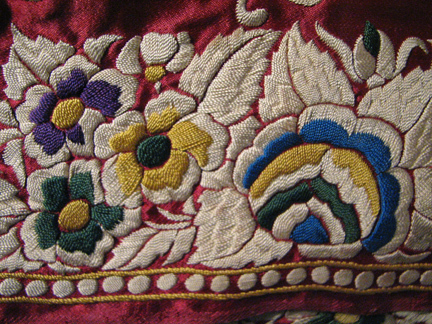 The border below is an example (this type of French knot work was not done in China). 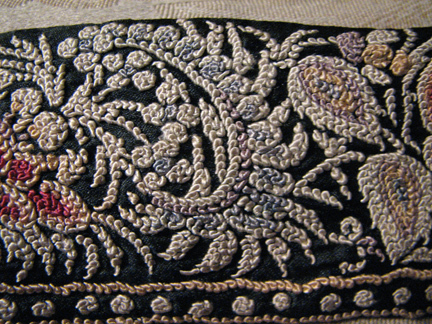 The stitches are tiny (for scale, the border is less than 2″ wide). Gorgeous! Fortunately in the last ten years or so, this type of embroidery has been given a new lease on life. One of these days I’ll have a new one too! Posted on July 19, 2007 at 3:41 pm in Memsaab in a saree	| RSS feed You can skip to the end and leave a reply. loved the embroidery where can i get one and what will it cost ? 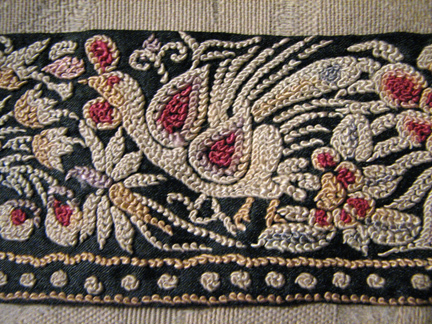 New ones are very pretty although I haven’t seen one where the embroidery is as fine on both sides as this one. They are quite expensive though, depending on the amount of embroidery, etc. Beautiful and fascinating to learn about, too. 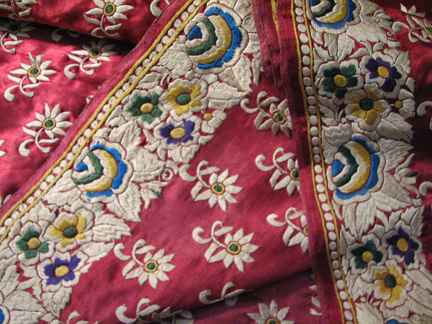 I bought a silk kurta recently that has work on it that is of this kind but much more workaday, not elegant. But I am pretty sure it’s Parsi style embroidery. It was about usd 100 or 90 I think (I was on vacation!) and I got it at Govinda in Los Angeles, a gigantic shop run by the Hare Krishna’s that has a great selection of kurtas and the like. It is pretty common to find the parsi-style embroidery on kurtas and saris again, although I don’t think the work is nearly as fine (at least I haven’t seen anything that comes close). But it’s still pretty, and I would love to see the kurta you have, Darshana! If I ever go to LA again I will look for Govinda! I love shopping for clothes in India itself. DEFINITELY GORGEOUS! I love all kinds of embroidery and bought bags, clothes, scarves with exquisite embroidery on them, some bought during my vacations in China, Thai, Malay, Europe and India is definitely a great place to shop for these exotic pieces …..
Great pictures of pattern. I love it. I am also involved in Saree business in Surat. And we also make variety of pattern. Really great pictures and article also. Im from Delhi and can show you some nice designs that we make. 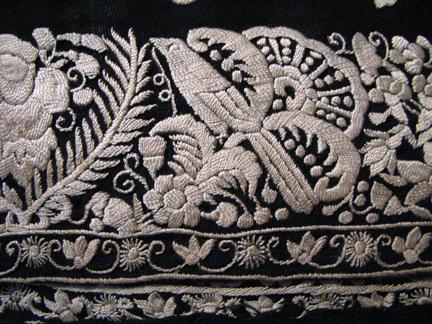 where can i learn parsi gara embroidery in mumbai? Anyone looking for ancient antique Parsi Garas, I have the original stuff left to me by my grandmother. These are ancient, and originals made in China. I just saw the articles and pictures. awesome! SS, Iam very interested in original gara s. Please send me the pictures and details. thanks! Hi memsaab…your original antique Parsi Gara-embroidered Chinese silk sari is simply GORGEOUS…I really love it…by the way, could you let me know if there are any shops in the US that specialise in such antique saris? If interested please check my webiste for more details and send me an email. Dear Memsaab, we’re a small women’s publishing house, wanting to use your lovely gara sari pic for a cover of ours. It’s not clear from the website if there are copyright issues, please can you let us know if we may use this with due acknowledgment of course and we’d be happy to send you copies of the book as well. many thanks, couldn’t find another way of getting in touch so used this comment route. I’ve sent you an email :) Thanks! Dear Memsaab,we are well established manufracturers of hand embroidery like shadow work with elegant petit point borders,cute french knot (well known as convent work).We are having our own workshop from last 25yrs in Cochin (Kerela). I am interested in your embroidery workshop. Please contact me on (mobile 7829930240) or Mr Aghosh Gopal on (mobile 9447263434) at your earliest convenience. Kind regards, Andrea Geisler. I have 2 for sale! Located in CA. Let me know if interested!